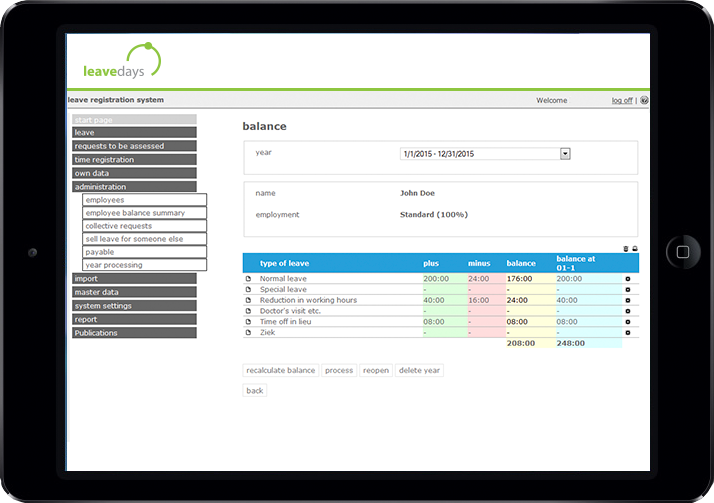 Leavedays allows employees to have an insight in their current balance and enables them to request leave instantly. Also, the system shows the company’s current occupancy, so managers can take that into account when considering a request to be assessed. Leave entitlement and differences in contract legislation are easy to input, and the system contains multiple reportage possibilities. 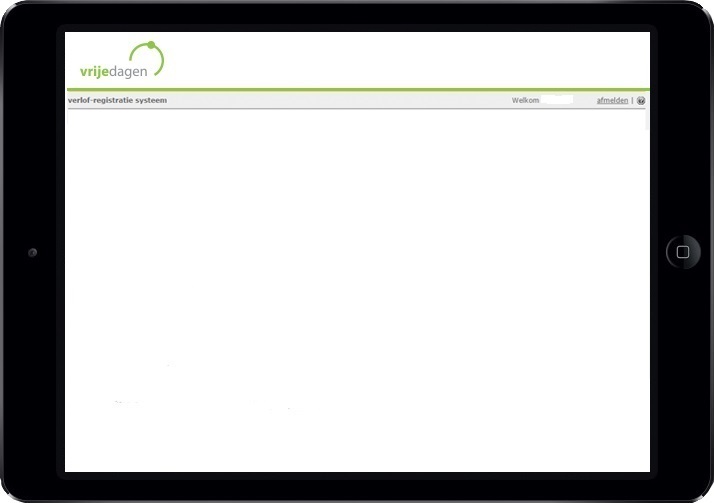 Watch the tour and discover what you can do with Leavedays’ leave registration or experience a demonstration for free! 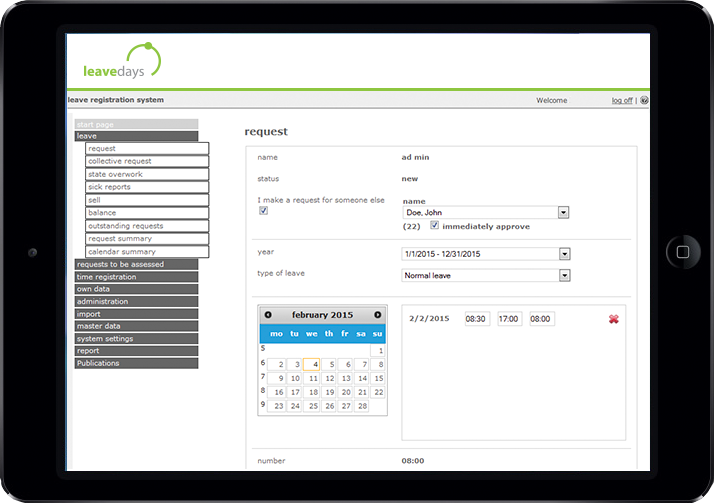 Leavedays enables managers and/or administrators to report illnesses and recoveries of employees. These are also visible in the balance of the employee, and are shown in the current occupancy. Naturally, the sickness registration can also be registered into several reports. 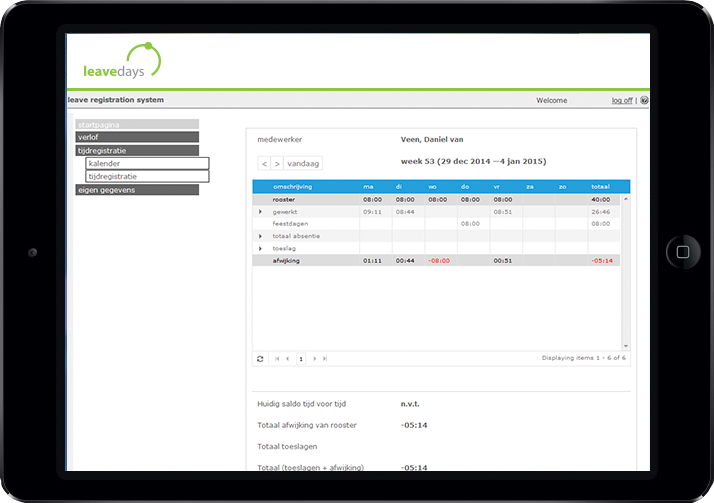 Watch the tour and discover what you can do with Leavedays’ sick leave registration, or experience a demonstration for free! Leavedays allows employees and managers to register overtime. Overtime legislation, and the corresponding percentages are easily instituted, in order for the employee to receive the proper compensation. Overtime can either be entered as ‘time off in lieu’ or as ‘payment’. Watch the tour and discover what you can do with Leavedays’ overtime registration, or experience a demonstration for free! Leavedays is specialized in the combination of time and attendance registration. 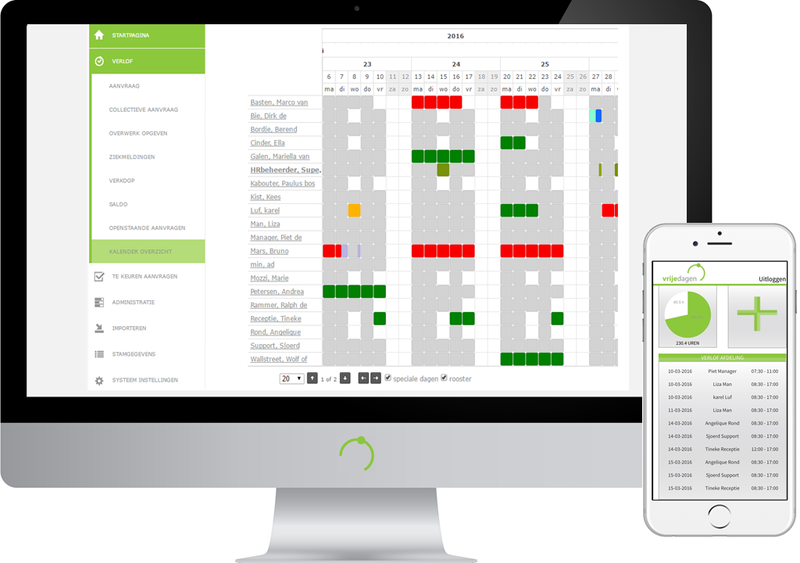 The time terminals create a better insight in the presence and absence of the employees, and can be assessed in a matter of seconds. This proves to be especially useful in the case of inspections or calamities. Other than that, it is possible to manually enter your working hours for a variety of projects or activities. 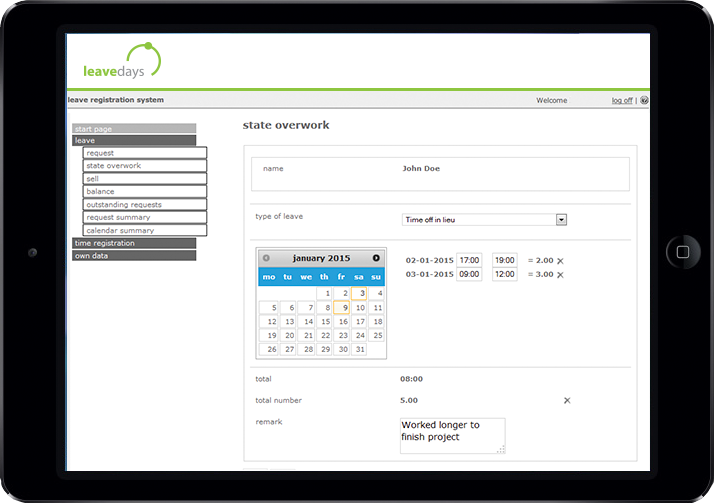 The working hours can be monitored via the weekly reports and can be processed with any desired purpose in mind. Watch the tour and discover what you can do with Leaveday’s Time- and Attendance registration, or experience a demonstration for free! The employee can enter a request using their own account on the internet. Select a type of leave and click on the correct day or time-period. A direct connection to the employee’s roster ensures that the right number of hours will be taken off the balance. This allows the employee to instantly see the result of the request on their balance overview. 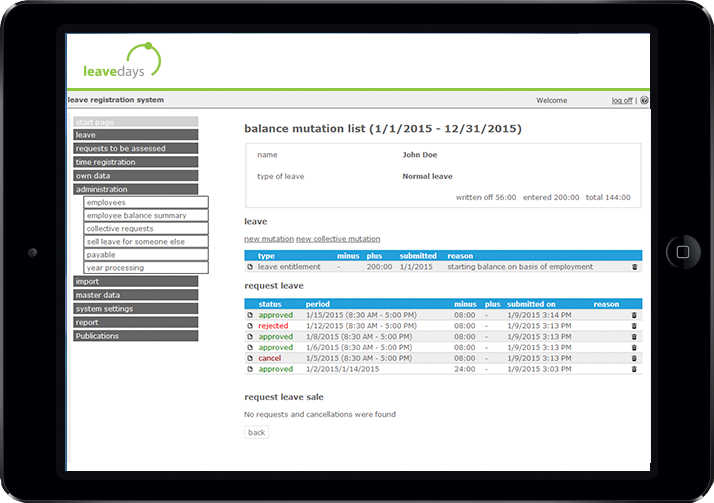 Your balance is always up-to-date and will be displayed clearly for every type of leave. However, some types of leave will not display a normal balance, but instead display the number of special leave days. This is the case for illness, special leave, and doctors visits. “Normal leave’ shows the accrued entitlement conforming to the 2012 legislation. The balance summary shows all types of leave, and the history and overview of all submitted requests is shown under ‘detail’. The status of the requests and the entitled leave days can also be viewed here. It is possible to forward the approved requests to an Outlook calendar. What is the occupancy of my department in the period in which I want to request leave? First, you can take a look at the calendar summary, to see whether it would be useful/possible to even request leave. This will save you a lot of time and unnecessary communication. Every color represents a different type of leave, as well as the status of the request. Stating overtime is an optional feature and can be turned on/off. The specific time and date of the overtime has to be entered, after which it has to be assessed via the authorization flow before any balance is added. As soon as a request has been submitted, the manager receives an email about it. The manager can either approve or reject the request. In turn, an email will be sent to the employee, with the final decision. Managers can evaluate the occupancy of the department effortlessly, before approving or rejecting a request. This way the occupancy of the department will always be considered and planning can be taken into account. The option to add comments to the assessment is available in order for the employee to understand the decision made. Managers are allowed to submit a request for their employees. The employee will be informed of the changes and submissions by email. It is possible to designate a temporary replacement for the position of manager, for example when a manager is sick or on holiday. 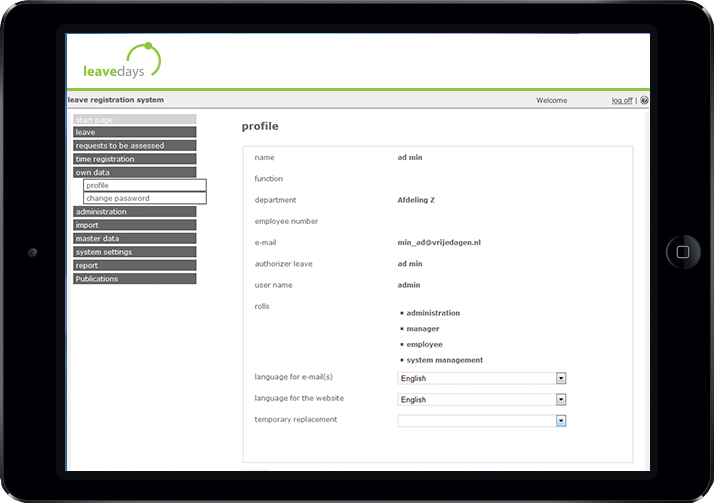 A temporary replacement for the manager can be selected in the ‘profile’ menu. If you want to change the language of your account, you can also do this in “profile”. Managers always have access to an overview of the current balance of all the employees of the department. This information is very useful for specific management purposes. Managers receive the requests of their employees by email. The email provides a link for the manager to immediately go to the application, saving both time and effort before assessing the request. Cloud solutions make it possible to look at the ‘who-is-inside overview, regardless of your location. This overview provides a clear distinction between the present and the absent personnel. Furthermore, it immediately shows the exact time of arrival and departure of every employee. Every employee is connected to the weekly reports. These include information such as: the number of hours worked, leave days and sick leave. This way, both employee and manager have a clear overview of the employees’ workweek. This proves to be useful for payment or management purposes. Weekly reports can be manually altered, and submitted for approval. For employees who do not use time terminals to register their hours, or manually add hours to their schedule, it is possible to register time for activities. Their managers will have to assess this; the overview shows a clear difference between registered time, and clocked time as registered by a time terminal. We are happy to give you a demonstration, in order for you to gain a good understanding of what Leavedays can do for you!